Microglial cells are “the first line of defense” of mammalian brain. The tiny processes of “resting” microglia are restlessly moving, surveying every corner of brain parenchyma. They quickly react to micro-lesions by surrounding a broken capillary or an apoptotic neuron and cleaning up the debris. During ageing or inflammation, microglia lose their ability to extend processes towards the lesions site; their morphology changes dramatically, they become activated and start migrating. 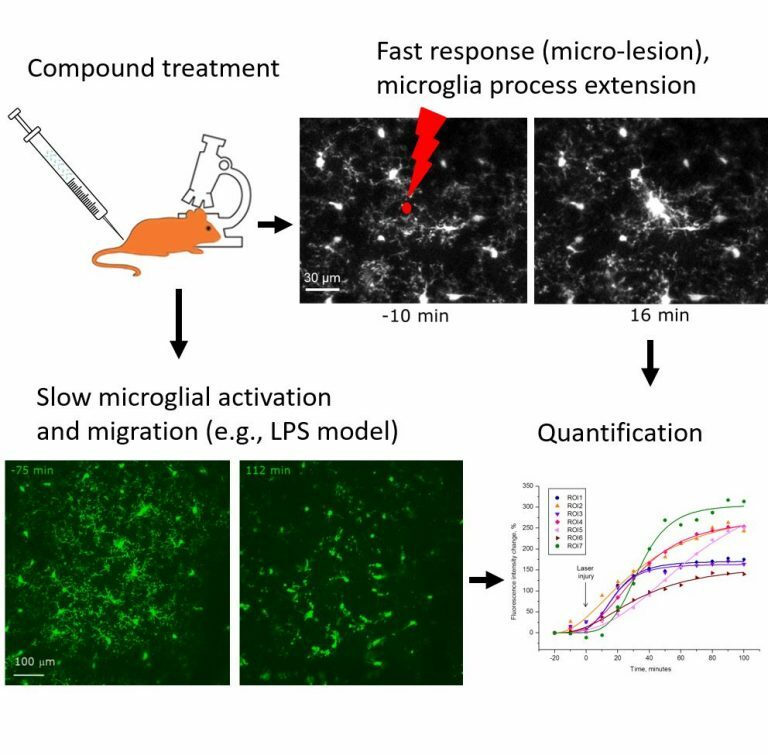 Neurotar’s microglial imaging assays offer a variety of readouts, such as quantification of motility rate of microglial processes, kinetic analysis of their extension towards laser-induced microlesions, changes in cell morphology (cell soma size, process branching) and migration under inflammatory conditions, and co-localization of fluorescently-tagged molecules (e.g., BBB-penetrating antibodies) with microglia and their sub-cellular organelles (e.g., lysosomes).